I'm at the car dealership today getting some maintenance done on my Ford. There's a new service manager dude. Why is it that every time I'm here, they look at me with what seems like a mixture of pity at what they perceive is my lack of knowledge in auto maintenance, and confusion that I dare challenge their cherished and deeply held notions of what a woman ought to know about cars? Oh wise and honored Mr. Service Manager, when I say there is a rattle under my floorboard while turning sharply, please believe me. I am not just hearing my CD cases flop around in the center storage compartment. I am really not that stupid. I also know where the oil goes, where the radiator is, how to change a tire and where to properly connect the jumper cables. I brought my knitting with me, which is something I do quite often anymore when I know I'll have some time to just sit and wait. So off I go to the terribly uncomfortable service waiting area, lugging my super-sized knitting bag. It began its life as a beach bag. I mentioned before that my husband and I got it in Cozumel when we took a cruise two years ago. I don't think I could get it zipped up if I wanted to. It always contains at least two of my current projects and every single piece of knitting equipment I have, including three complete sets of circular needles, with some random straights, circulars, and the dreaded dpns thrown in (in case I need to illustrate their evilness). There are three paper knitting books I own (I prefer digital), several single patterns and all sorts of accessories I've picked up along the way. It's a lot of junk to tote around, which I don't always use, but I hate not having what I need when I need it. Like yesterday, I was at the hospital with a friend whose husband was having surgery. I thought I was being smart because I put what I thought I'd use in a smaller, less conspicuous bag. I was only working on the infamous sleeve from my last post, which incidentally has not yet made it to adolescence -- more like toddlerhood. So I get to the end of the cuff and need to switch to a larger needle. Um...needles. Too bad, as I was there for several hours. The good news is, I made it through several levels in my favorite Mahjong game. But today I brought the jumbo bag with everything in it. I'm not taking any chances. Last time I was here, it took over 2 hours. Hey, New Mr. Service Manager just came in. And guess what he had in his hand? 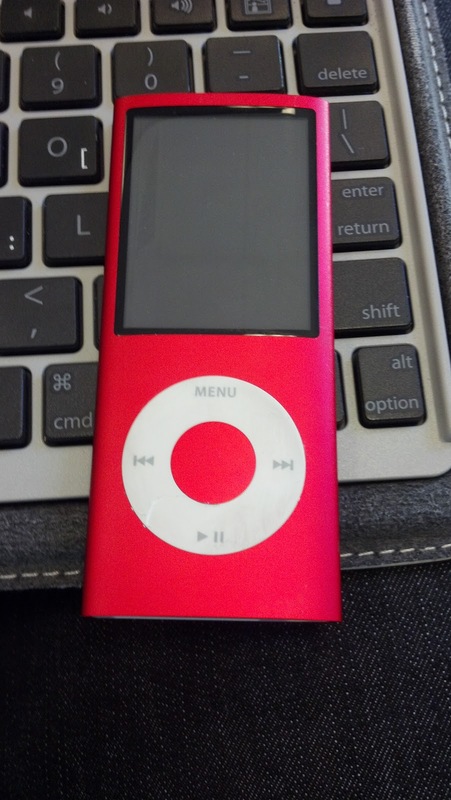 My 16 GB special edition RED iPod! And guess where it was. UNDERNEATH THE FLOORBOARD. This new guy gets a huge tip for actually listening to me in spite of the fact that he thought I was crazy. It looks no worse for wear. I can't wait to charge it back up and use it again! Yay! What an entertaining post. I love that you were proved right about the iPod. I can appreciate why you want to take all you knitting with you. I have arguments with myself over which projects to take when I go out.